Of course there’s so much to the answer, but like other identities we grow into, it’s all in the doing. Today, I want to focus on the social aspect of reading. We often conceive of reading as a solitary activity, and while it most definitely is, from the earliest age we see that reading is very much social as well. Perhaps it is actually reading together, being read to, reading to someone else, or just talking about books. There’s a reason crazy fandoms develop around books! Sammy reading to Stephen and Teddy! Sammy, who is an early reader, exemplifies the social nature of reading. He memorized the great board book classic Brown Bear, Brown Bear, What Do You See?. So he happily and confidently read the book to his younger friends. Not only is he introducing the younger ones to books, but he is building into his growing identity as a reader. A win-win! 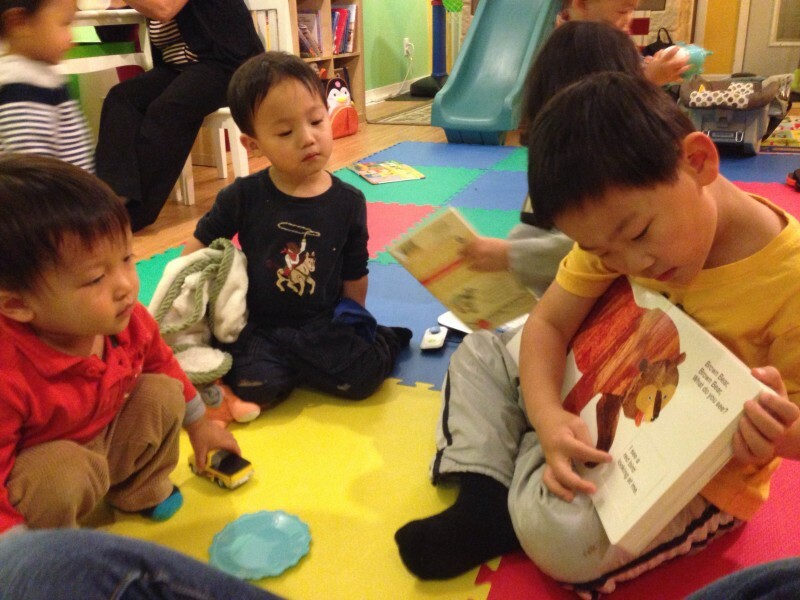 This entry was posted in On Reading, Reading Snapshots and tagged social reading by hemilykim. Bookmark the permalink.